Local businessman Frank Apa received Patch, a Shih Tzu, as a puppy. Patch was a sweet, endearing little dog whose ability to connect with people quickly became apparent. He went to work at the Oakville Toyota dealership every day with mr. Apa and became a true ambassador demonstrating the relationship that can develop between people and animals. He became a company companion, mascot and corporate spokes dog with an integral role in the owner’s dealership. He had a positive impact on all those that had the pleasure of meeting him. 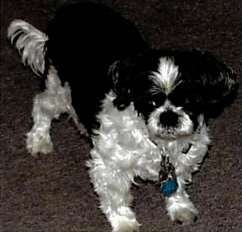 Sadly, Patch passed away in August 2002. To honour his long-time companion Mr. Apa dedicated September to his dog’s memory. Over the month, the Oakville Toyota and Lexus of Oakville dealerships raised $13,300 in Patch’s name. The money was generously donated to the Oakville & Milton Humane Society. The Society’s Board of Directors supported using this donation to develop an education program promoting the importance of the human/animal bond, featuring the dog that represented the ideal role model – PATCH. Mr. Apa continues to donate to this program each year. Our relationships with animals can truly change and enhance our lives and the lives of those around us. They have a proven effect on our ability to connect with other people, increase our lifespan, lower our stress levels and improve our self-confidence. They also help to teach us to be kinder and more empathetic to those who are different from us. The Patch Challenge teaches children that People and Animals - Together Create Harmony. We challenge schools to inspire students by inviting the Humane Society into classrooms and completing the age-appropriate "kindness" tasks that are provided through The Patch Challenge curriculum. To learn more about The Patch Challenge, contact the Oakville & Milton Humane Society at 905-845-1551 or visit omhs.ca. Mr. Frank Apa and friends of Patch for supporting The Patch Challenge!